Find hotel near Garuda Wisnu Kencana Cult .. This sixty hectare cultural park is dedicated to the Hindu God Vishnu and his mount, the Garuda. As of time of writing, construction on the gigantic statue monument of Vishnu is ongoing, with the upper body and hands completed, and also the Garuda’s head. It is being sculpted by Nyoman Nuarta, a Balinese artist. See the fountain next to it, which is called the Parahyangan Somaka Giri; it is said to have healing powers. Today the park is one of the most popular venues in the city for public events - exhibitions, fairs, festivals, conferences, concerts and performances. To this end it has an amphitheatre, an art gallery, a souvenir shop, 260 meters above the sea level, the park has an unparalleled view of the city and the ocean. The view is especially nice from the Indralok Garden. The Kecak dance is performed in the GWK amphitheatre every evening at 6:30pm. A parade goes around the park every day at 5pm. The park is a great place for a stroll. The limestone walls and their carvings give is a sense a gravitas and history. There are also two restaurants inside the complex. Find out about upcoming events from the park website, and get tickets there too. Take a bus, ojek or bemo to here. 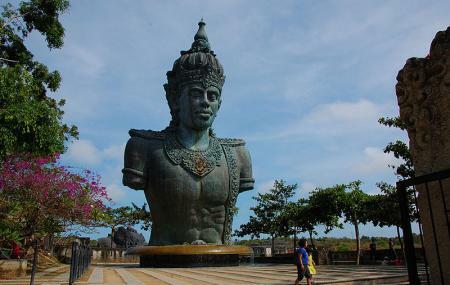 How popular is Garuda Wisnu Kencana Cultural Park? People normally club together Sangeh Monkey Forest and Nusa Dua while planning their visit to Garuda Wisnu Kencana Cultural Park. People also prefer to end their day with Garuda Wisnu Kencana Cultural Park. One of my fave place to visit. To see a great art work that many talented people did. So many places to visit and great spots to make memories. And i also love to watch the show in the amphitheater, it tells us about the history of Garuda Wisnu Kencana. I just love to see history become real and the perform it beautifully. Unfortunately, the iconic statue was closed due to an event when i came there. But it still fun. We had dinner at the scenic restaurant and loved it. Great local style of food with a western taste taken into consideration. I recommend coming here on nights when fireworks can be expected such as Christmas and New year's Eve as you will be able to see the whole island come to life and get a bird's eye view of everything. We seen a small fireworks show along way off and it was fantastic. Food is very reasonably priced which was a nice surprise as it is in a major tourist area. The staff are accommodating and very good at ensuring that your table is looked after and you are served without delay. Over all I would recommend this to most everyone though it is a bit out of the way after dark. Down side to this restaurant was we were made to park at the entrance to the park and then walk 500 meters up the hill with small children to get to it. Dramatic landscape with a park carved out of limestone. Good photo ops. Plenty of refreshment points and souvenir shops. Please dress decently as this is a religious site. Note that the main statue is best viewed from the park but you can go to the statue itself. The traditional dance in the evening is very engaging and authentic. Note again that this is a religious dance, so behave accordingly. It just has this big statue. The area inside is huge and walking the entire area becomes exhausting. When we visited here on Apr 2019, the statue has been built completely and inaugurated but actually the main building is still not fully operational because we cannot take the lift that bring us to the top of the statue. Unfortunately there are long queue to go to the statue. The park itself is clean and can be a good photo spots. This place is really beautiful. A very big statue of Garuda and Wishnu is there.This cultural park has a great things to see. Some of the places like temples are considered to be holy so you need to have modest dress. They give to dresses at the point of attraction itself. Most of the places have ticket price which are a bit more for tourists. Good place to go and explore, at most of the places you will have to walk a lot to be ready for great exercises.